For most of us the weather is getting colder and the days are shorter. That equals less range time, but that doesn’t mean there’s less opportunity for practice. There are many ways to train at short ranges, indoors or out, that don’t involve shooting past 200 yards. Coupled with dry firing training at home, you can keep those shooting skills up to snuff in the Winter months. Dry Fire Drills If you’ve read the previous article on practicing for a successful NRL and/or PRS season, dry firing is mentioned at the top in regards to a daily practice routine. One thing to note about dry firing, keep an eye on your firing pin or build some dummy rounds with spent primers. While dry firing is generally considered safe for bolt action rifles, you can still break a firing pin doing it. Might take a year or two, but it’s a possibility. Also, if you’re using dummy rounds, do not put live rounds in the chamber. It’s easy to get complacent when handling a firearm every day. Do not get complacent about firearm safety. There’s the safety brief. Now grab a Dry Fire Optical Training Adaptor, or similar, and set up that home range. Troop lines? Indoors? It can be done, but it’s not going be exactly like laying down at Battle of the Breakneck and lobbing DTACS over canyons. Set up two or three boxes with 1MOA sized dots on it. Space them far enough apart so you have to break your position to engage the next target. Next pull some DOPE for your rifle, put it on your Sidewinder or similar DOPE management system, and roll. A good start would be 2 minutes for 5 targets, 2 shots per target. Distances could be 400, 500, 750, 800, and 1,000 yards with a 7-10 MPH full value wind. This allows you to practice acquiring targets, moving through the target array, holding/bracketing wind, and dialing DOPE. To switch it up, move the time to 1:30 seconds or use holdovers only. One thing this can’t teach is watching your impacts/misses and adjusting for wind/incorrect DOPE. That is something you just have to learn at the range. The really good shooters only miss once on a bad wind call. It’s all about repetition, so replicate the hardest prone stage you might see. Start standing, port arms, all gear in hand and work on getting down to finishing in 90 seconds. Then try to do it weak/support side. You’ll notice after a while you can finish before time ends, but focus on good fundamentals. Doesn’t matter if you finished in time if you’re slapping the trigger. Barricades and dry fire work really well together. You can easily and cheaply construct half of a PRS barricade that won’t take up much room in a garage, basement, or backyard. Start with running the standard PRS barricade stage. One target, four positions, two shot per position, 1:30 time limit, 2 MOA dot on the target box. Work on doing it with one front bag as support. If you don’t think it can be done, watch this video of Dave Preston from Long Range Precision Shooters. That’s the goal. After that, work on running it with a tripod as rear support. Using a tripod for support is a good way to get very stable, but it comes at the cost of speed. If you drill moving with it, using it becomes a lot easier. There’s also stages or conditions where using a tripod is so advantageous that it can’t be ignored as a viable tool in your kit. Learn to use it. Barrels are another common props seen on the firing line. 55 gallon drum barrels are not hard to find at a local farm/ranch supply store. Buy one and practice the three standard positions: top, laid on its side horizontal, and laid on its side vertically. Work on getting into position quickly and breaking a clean shot. Shoot it with one, or two, bags, as well as with a tripod for rear support.. Standing. Sitting. Knelling. Unsupported Prone. The four things every shooter dreads seeing in a match book. Not anymore. You’re going to need a larger dot on that box to do this without getting frustrated, say 4 MOA. Then work on doing it with or without your sling, depending on how you like to run it. Chances are you’ll find out a way that works best for you. It won’t all translate, but check out some videos on Service Rifle competitions and the techniques they use. You can’t train for everything you’re going to see, but you can get close. Get creative and try to build some props. Perhaps you have some old sheets of plywood laying around you can work into a rooftop. Maybe an old tire that’s big enough to use as a prop. Stick with those 1:30 time limits, and 2 MOA dots, it will all work in the end. Get creative. The tripod is one of the most useful tools any practical/tactical match shooter can have. Not just for gaming it up as rear support, but also for easy positional practice. If there’s no room for a barricade in your apartment, use a tripod set at different heights to work on building positions. If you have an ACRA clamp, work on shooting off the tripod with it. If not, throw your Tactical Udder, Gamechanger, or Fortune Cookie up there. Work on placing the bag on the tripod securely, quickly acquiring your target, and applying a smooth trigger press. This will help simulate any shooting prop height you’ll ever see. One thing you can count on in Colorado in the Winter is inconsistent weather. One day it’s bitter cold, next it could be snowing, or there could be heavy fog. This can ruin a long drive to the range, or cancel it all together. However, you may have a shorter indoor 100/200 yard range you can practice at. Outdoor works too obviously, and they may be more accepting of shooting off props as well. This is where a 22LR trainer also comes in handy. A lot of the same principles apply for short range practice as they do for dry firing. One thing that can’t really be done with short range centerfire is troop lines. So instead, work on dot drills. There’s many different ways to shoot dots, and lots of places to download targets such as Max Ordinate and Sniper’s Hide. I like to run them two ways. One is start on the gun prone, ten 1-inch dots at 100 yards, 50 to 60 seconds, one shot per dot. The idea is to work on quick precision and transitioning. Another drill is focused on getting down and acquiring a target quickly and breaking a good first shot. Start with five, 1-inch dots at 100 yards. Start all gear and rifle in hand. Set the timer for 15 seconds and work on dropping down and engaging the dot with one round before time runs out. Then do it again at that same dot. The idea of shooting the same dot twice is to see how consistent your trigger control is under time. If you don’t have a barricade, use the top of a chair or a shooting bench. The point is to get creative with what you have and use the space available. Nothing humbles a barricade shooter more than paper, and working to condense your wobble while aiming at a 3 inch shoot-n-see at 200 yards will likely humble most shooters. With 22lr ammo back in stock, NRL22 matches, and the introduction of more precision 22lr rifles, many shooters are going to rimfire for cheap, easy live fire practice. You can go all out and build a clone of your match rifle with a Vudoo Gun Works barreled action, or get close with a CZ, Remington 40x (image right), Savage or Ruger Precision Rimfire. You don’t have to reload it and rimfire practice offers shooters actual results on paper. It’s a great idea, but one I have not been able to try. However, Andy Hawkins from Hawkins Precision, who was 2017 PRS Rocky Mountain Region winner, uses rimfire for his practice. 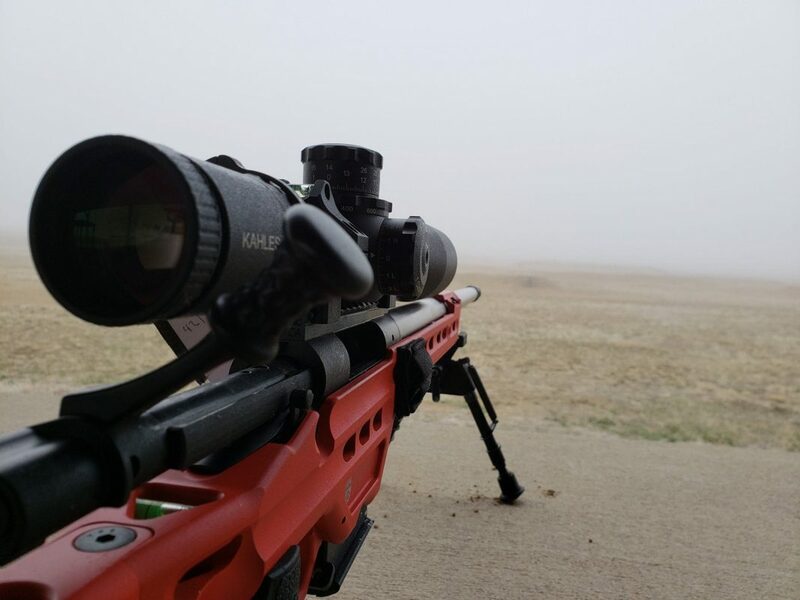 At first Andy thought he would practice shooting long range (200 yds+) but he realized two things, close range provides a great opportunity to work on fundamentals, and most almost anywhere you can shoot 200 yards you can shoot 600-1000 yards. Practicing with a rimfire at closer ranges would provide him an opportunity to work on marksmanship fundamentals and positional stability. Hawkins built a 40 yard range on his property and a barricade with 8 positions. He runs it using 5 positions in several different orders to practice moving efficiently, gear management, time management and stability. The barricade has a kneeling position, a position that is about 3 inches above kneeling (low standing), standing, high kneeling, low kneeling, and a low kneeling box cut in half diagonally to make it difficult to get a rifle and bag into. Ninety percent of the time Hawkins runs the barricade with 2 shots per position at 1/2 inch dots on paper with no time limit. On his barricade Andy makes sure to use both of the standing positions and a high kneeling position. With all barricade practice, start port of arms. If you need to take the time to build a better position, do it. Once in a while, set the timer for 90 seconds to see if you can complete it while getting the same number of hits. The ultimate goal here is to see if you can run clean right handed and left handed in 90 seconds with one bag. That’s a lot to digest, and you can see that everyone does it a little differently. The goal is all the same, get better while working with what you have in terms of distance, time, and available shooting funds. You will likely find a system that works best for you. Andy Hawkins uses rimfire, I have to rely on dry fire living in the city. We’ve found success with both methods. Tailor your training regime to your needs, get into a good repetition, and keep on it. Diligence will pay dividends in the end. Nick Depperschmidt is one of the founding members of Black Flag Precision. A group of precision rifle shooters that compete in and host practical/tactical rifles matches in the PRS, NRL, and Border Wars Series. Nick’s main focus is training and practice techniques to help his teammates and other shooters succeed on the national level. If you’d like to reach out, email Nick at [email protected]. This entry was posted in Bison Tactical Blog, News and tagged NRL Training, Precision Rifle Practice, Precision Rifle Training, PRS Practice, PRS Training.